Corporate groups, sporting groups, families and friends. Barrington Outdoor Adventures offer you the perfect day of outdoor adventure to share with your colleagues, team members, family or friends. On the pristine rivers or high green mountains, you’ll reconnect with each other and with nature. Create memories – and stories that will last a lifetime – of your exciting adventure spent in a spectacular environment of World Heritage Barrington Tops wilderness region. An adventure with us is for everyone: all ages, all fitness levels and abilities. We also love to see and encourage parents in sharing healthy outdoor activities with their kids. We offer tuition for both children and adults and all equipment can be provided. If you’d like to plan your own adventure, we can help with advice on locations, equipment hire, transport to your activity locations, camp sites and accommodation. Contact us for advice or a quote. Relax. 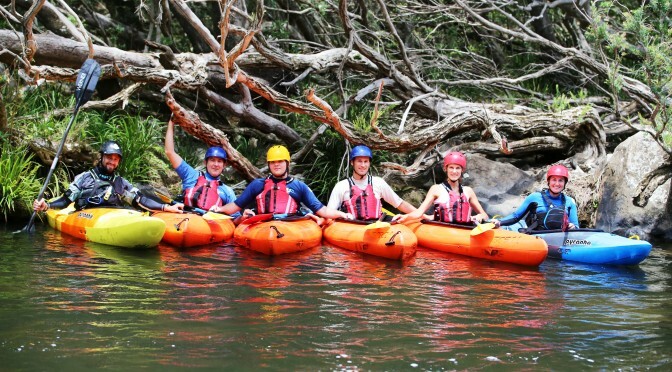 We’ve got everything covered for your next teambuilding weekend: Gourmet meals, quality accommodation and quality equipment to keep the staff happy; exceptional adventure based programmes customized to your group’s needs; and the breathtaking backdrop of World Heritage Barrington Tops wilderness region. An exhilarating kayak or mountain bike adventure could be just what your coach is looking for. We use an inspirational outdoor setting to help your team further develop personal and group skills, focussing on co-operation and team building. Or you can visit us for an adrenaline packed weekend to help wrap up the end of the season. Whatever your reason, our personalised group tours will definitely provide you with a fun, memorable experience that supports positive relationships amongst your group. We guarantee first rate quality and safety for your team at a competitive price.